The Institute for Worship Studies was conceived in the early 1990s by Robert Webber. The goal from the beginning was to offer academic courses to train pastors, music ministers, worship leaders, theologians, church leaders and lay people to understand and practice renewed worship. In the mid-nineties, two programs were begun in conjunction with established seminaries. A program of studies leading toward the Doctor of Ministry (D.Min.) was begun in connection with Northern Baptist Seminary in Lombard, Illinois. At the same time a Master of Theological Studies (M.T.S.) in worship studies was established at Tyndale Seminary in Toronto, Canada. Numerous applications were made to Northern by music ministers and worship leaders who had completed their master’s degrees in music, but wanted doctorates in worship studies. Because a Master’s in Divinity was required for entrance into the D.Min., these students were rejected for graduate study. 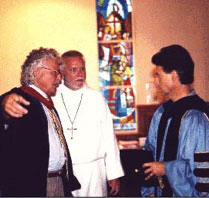 It was Robert Webber’s conviction that there should be a doctoral program of worship study with wider admission standards. This degree should teach worship from a biblical, historical, theological and cultural perspective without requiring a theological master’s degree or its equivalent. James Hart, then the music minister of Grace Episcopal Church in Orange Park, Florida, committed the use of their church campus for the school. Hart made the appropriate connections in the state of Florida, and the Institute for Worship Studies was established as an authorized non-profit school in the state of Florida through membership in the Florida Council of Private Colleges, a state-approved educational association. The Institute for Worship Studies opened with its first class of twenty Doctor of Worship Studies (D.W.S.) students in June of 1999. The Master of Worship Studies (M.W.S.) program began in 2002. In 2010, IWS was granted Accredited Status by the the Commission on Accreditation of the Association for Biblical Higher Education (ABHE). In 2015, IWS relocated to the campus of Hendricks Avenue Baptist Church in nearby Jacksonville, FL. As of June 2017, 522 people have graduated from the Masters and Doctoral programs. IWS has conferred 383 D.W.S. degrees and 159 M.W.S. degrees, plus an additional 34 Advanced Graduate Certificates in Worship Studies. Students from more than 30 countries (including the USA) and more than 90 denominations have matriculated.